Min Mendis has taken to Kickstarter to launch a very unique LED metal dice, that has already raised over 5 times its required pledge goal to go into production, with shipping expected to start during March 2016. The Luma Dice as a unique dice have been caught all metal LED powered like dice that have to be the coolest way to play tabletop board games and adventures. Playing games should always be a fun and magical experience. Our job is to deliver you the most exciting dice for playing all your tabletop adventures! We have turned traditional dice on its head. Each side of dice lights up with different colored lights. 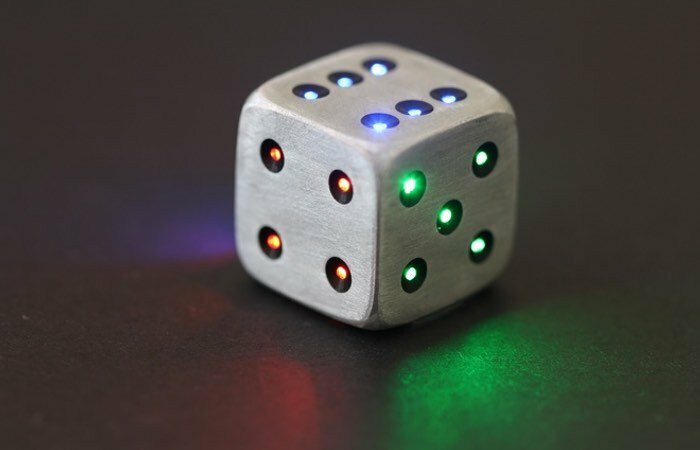 The dice itself is carved from a solid block of aluminum and uses an accelerometer to detect motion to turn the lights on and off again when not being used. Whether you’re into Dungeons & Dragons, board games or just a collector we think you’ll love LUMA DICE as much as we do. – RGB LED’s – Every dice has 21 RGB lights, each side with it’s own color. The 6 side is blue, 5 side green, 4 side red, 3 side yellow, 2 side purple/pink and the 1 side cyan. – Motion Detection -LED DICE knows when you pick it up or roll it and the light activates. After 20 secs of no use, it turns off to save battery power. We do this by including an accelerometer which can detect any motion. We are very proud of this feature and hope you enjoy it! – Replaceable Battery – You can change the batteries easily. Just unscrew the top and take out the old batteries and put in the new ones. It uses two small ‘SR54’ batteries which are sold at supermarkets and you can buy on Amazon for less than $2! – Produces fair rolls – LED DICE are well distributed across each side with regard to it’s weight. We have done our best to balance them, but we can’t guarantee perfect balance. We can guarantee however fair rolls and no heavy skews. – Stylish – With these you are looking nerdalicious! So if you think your game playing can benefit from the Luma dice jump over to the Kickstarter crowdfunding website and make a pledge from just $24 to make sure you are one of the first to receive a dice off the production line in March 2016.